I’m very pleased to be able to announce that HD 80606b is a transiting planet! It looks like priority of discovery goes Claire Moutou and the French and Swiss team, who beat at least one other team to submission by a matter of hours. I’m attaching a draft of the French and Swiss Team’s paper that was just sent to me. Congratulations to Everyone involved! Wow, that’s really impressive. What a catch! Hats off to Moutou et al. Now to fill in the blanks on the light curve and Rossiter time series. Amazing. 111 day period. 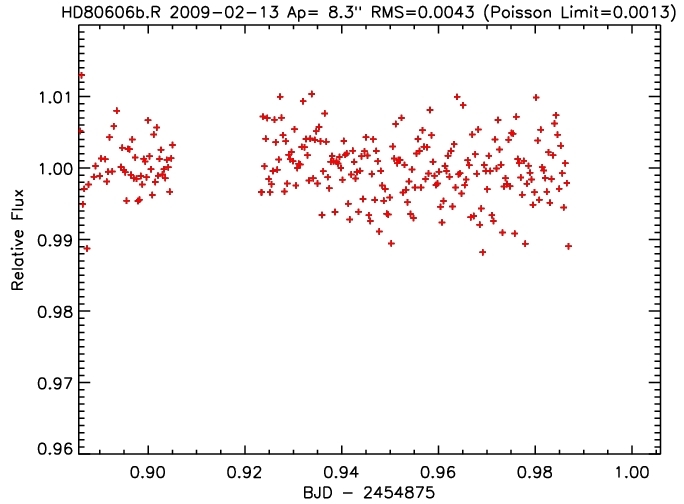 I wonder what the longest period eclipsing binary is and how 80606’s period compares. I also wonder about all the studies of orbital precession that could be aided by the enormous lever arm on 80606’s impact parameter. This planet is a gift from the gods. Congratulations to the French/Swiss (and Portuguese) team and also to the Systemic team that “put their money on this one” ! Our observations the night before show no ingress as of BJD=2454875.985, so according to their figure 1, that rules out b < 0.75 and a total duration of less than 13.2 hours. Also, the fact that the transit must occur so late strongly suggests a spin-orbit misalignment as their RM measurements can’t be symmetric. Congrats to Claire Moutou and co-authors! I mean our observations rule out a total duration of **more** than 13.2 hours.